Again so many exhibitions and so little time! Much has been happening in Newcastle and not just weird things with money, envelopes and politicians. In the art world we’ve seen two galleries reopen with great fanfare. Fresh and innovative are descriptions I would consider apt. 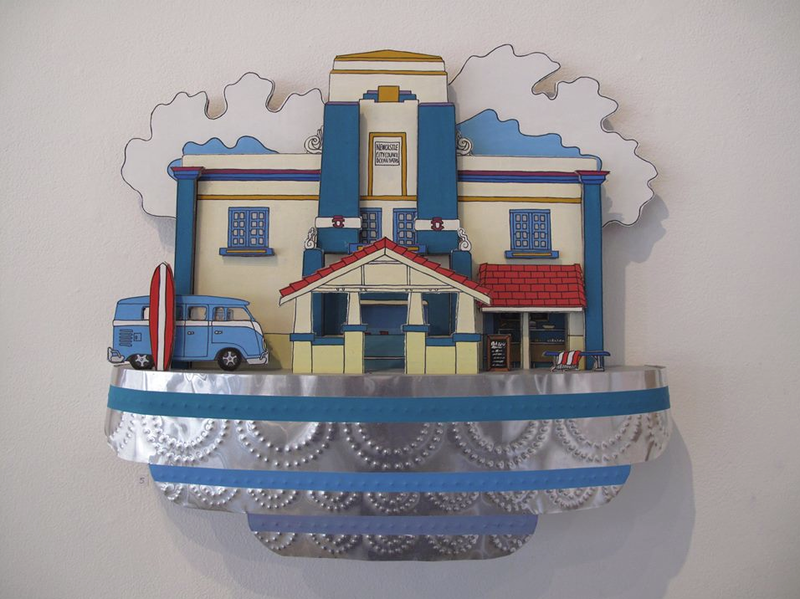 Curve Gallery in its schmick new premises on Hunter St caught attention with the artist Jane Lander’s cool rendition of dudes hanging out at Newcastle Baths. Over the road The Lockup was awash with arty types for the opening. A quick peruse on my part established the path this gallery will be taking. A conceptual philosophy will reign. 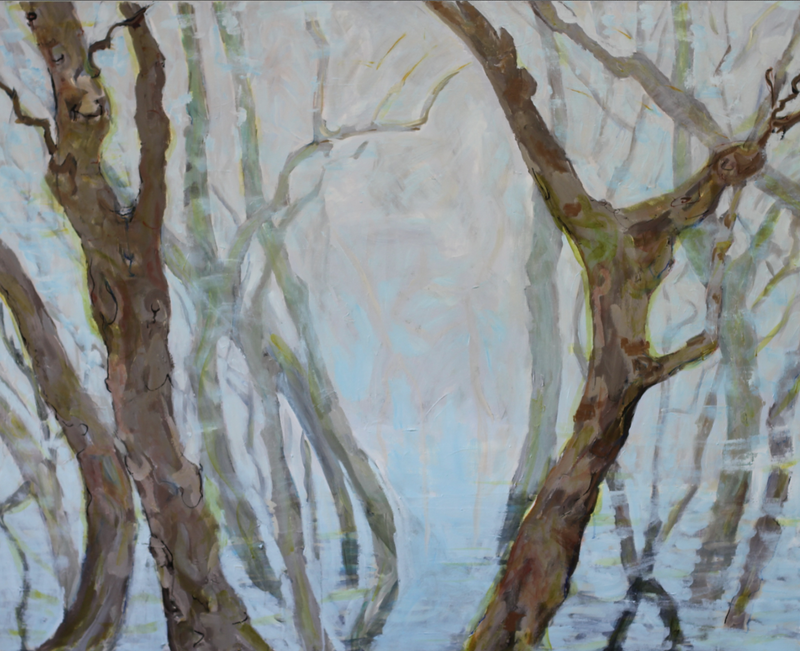 The present exhibition “Ash Island and its Transformations” features new works by artists Nicola Hensel, Cherie Johnson, Emma van Leest and Shan Turner-Carroll. Hensel’s drawings were exquisite, the detail rendered with supreme dexterity. 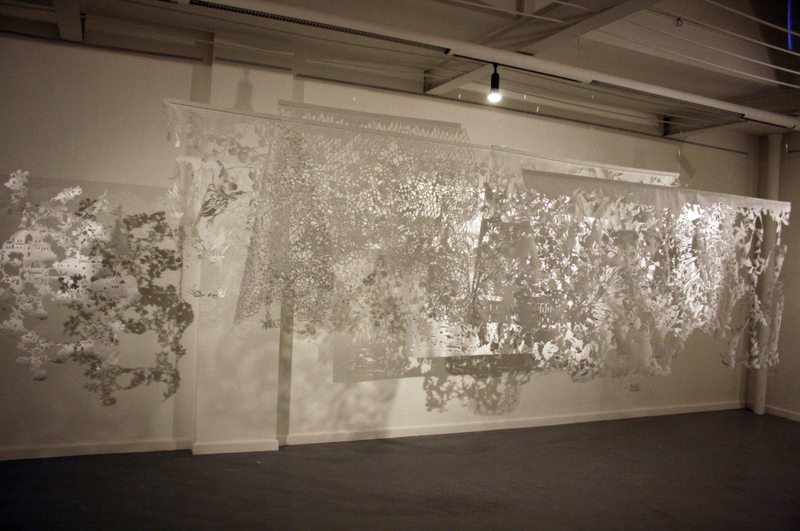 Van Leest transformed the space into draped ornamentation with paper so finely cut and handled the crispness of the shadows became the artwork. Due to the crowd I whisked about and was out of there before I could garner the full strength of the exhibition. I’m convinced though it would be worth my effort to visit again before it finishes on the 28th September. Qualifications from the Hunter St TAFE campus assure experimentation is a given. Emilie Tseronis and Ellen Howell have studied at this institution and are currently exhibiting at CStudios. Tseronis in particular delves into the extension of materials to produce a body of work atmospheric and tense. Howell’s large paintings proved popular and for myself I was chuffed to see another version of the iconic shark tower of Redhead. Of course in the adjacent rooms of this large exhibition space other notable works are on show with photographs by David Williams being a highlight. 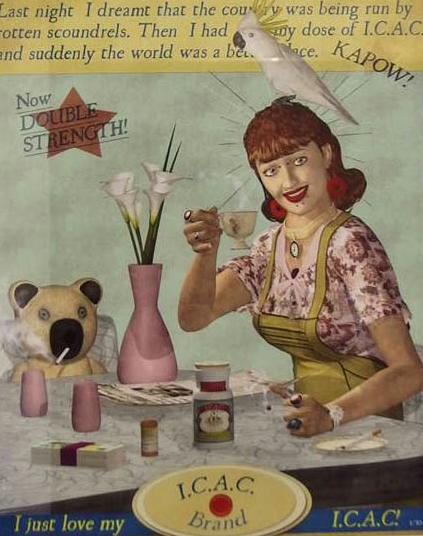 There is a certain something lacking at the current exhibition at Four Point Gallery and it’s quite possibly cohesion. “Of Places” brings together Madalyn Ward, Jennifer Wood, Matthew Chantrey and Dylan Smyth. These artists would have much to offer as individual exhibitors, however at present the show is more of a ramble with occasional flickers of brilliance. A manipulated photograph of an old station wagon overlooking the beach is a highlight for me. The last exhibition to take place at Timeless Textiles Beaumont St Hamilton was a stunner. 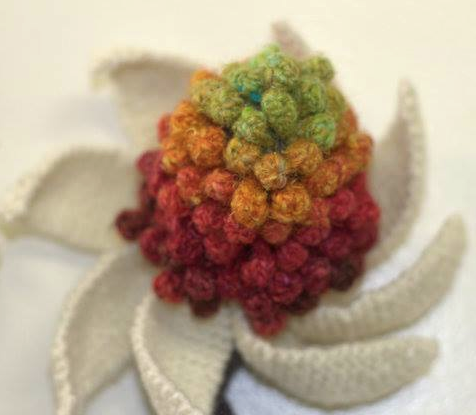 “Flowers.8” showed the extreme talent of a group of knitters who created homage to spring. The beauty of the flower was realized with Katherine Heinrich wielding the needles to form a wonderful array of corsages. The abstracted quality of Katrina Kellet’s wall hangings had me pondering the process. A quick google search revealed glimpses into technique which continues to intrigue and stimulate queries. It’s enough at this point to acknowledge her passion and skill. Also worth noting is that all the artists in this exhibition designed their knitted creations. 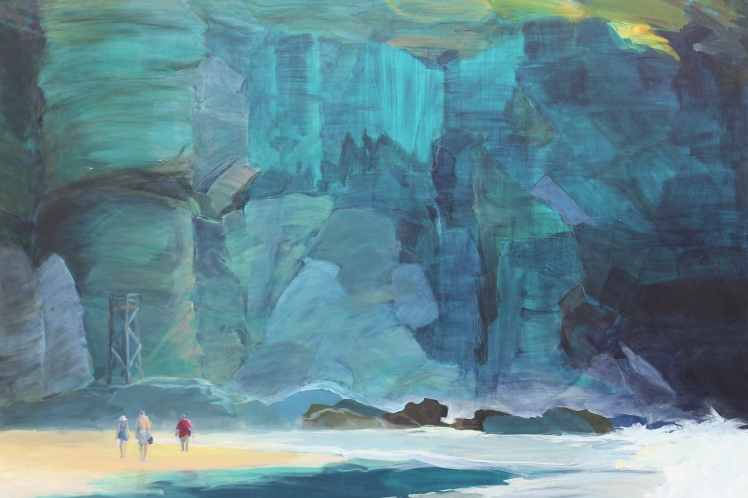 “2014 Spring Salon: Annual Studio Artists’ Exhibition” allowed a peak into the valuable commodity that is the Newcastle Community Arts Centre. This is not just a piece of treasured real estate but a hive of imaginative activity that is precious to the Newcastle art community. So many talented individuals utilise these premises and this exhibition coincided with the studio open day on Sept 6th. Andrew Finnie’s ICAC revelation was the highlight for me but of course I always love the vibrancy and technique of a Peter Lankas. Everything was pretty and cute at Back to Back Gallery last month with the exhibition “Transient”. The tightly woven and intricate paintings by artist Catherine Kavanagh were a delight. A highly polished painting is not always my cup-o-tea however these works were shiny and nice and deliberately happy. Also the wall mounted installations by Lochlan Howard reminded me of The Strutt Sister’s work but again with that high polish. These little insights into an imagined world were very appealing. In fact the entire exhibition was a step into a beautiful utopia. This week I’m looking forward to taking a look at the Newcastle Emerging Artist Prize and choosing my winner. Happy arting!